Now I am very much aware that it being only the 10th December that it’s a bit early for Christmas parties and the like but the reason I put this subject on the 5th day is because I’ve already had our work’s Christmas party AND I really wanted to share some photos with you! First up though it’s the Coca Cola truck visit! It’s such a weird thing but for some reason, as soon as you see the Coke Advert (Holidays Are Coming) it’s deemed Christmas time! I’ve actually not seen the advert this year but I have seen the real life truck! It was coming to visit locally on December 4th and seeing as it’s never been this end before we decided to go see it. There was a massive queue to get an official photo with it but we weren’t that fussed… especially since we got to take photos from the sidelines anyway. Whilst we were stood there someone said that Santa was inside the lorry but still I wasn’t going to queue! In all honesty, it was disappointing as there wasn’t that much going on. It could’ve been so much more! My second Christmas outing was work’s Christmas party! It was the first time we had an afternoon party but it was good because I wouldn’t have gone if it was after work because I want to get home to Little Miss. We went to Eduardo’s – a modern looking Italian restaurant. I’d never been before but I had looked through the window and seen it looked very nice. After we arrived on Friday the first thing everyone said was that the place looked stunning and the Christmas decorations were lovely! It was all white and silver with some purple and lime greens thrown in – just my thing!! When the menu was sent through in October I was in the back of a car in Malta making my decisions so I’d forgotten what I’d ordered! 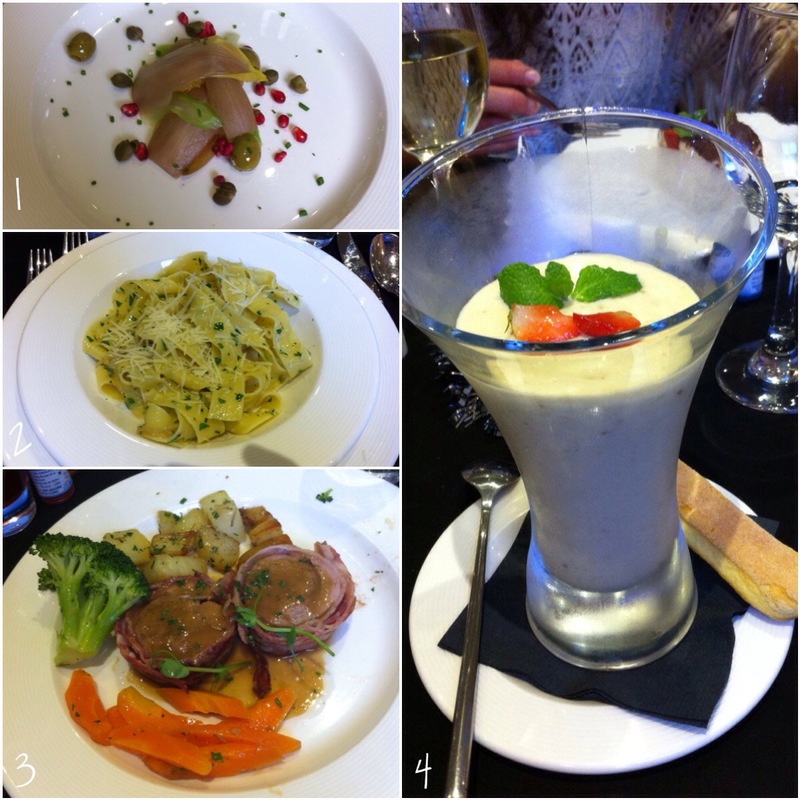 All I remember was that there were 5 courses of which we got to choose the main and pudding. First course (not pictured) was “Zuppa di Minestrone” which was a crunchy Minestrone soup. It was nice but there was too much of it. Second course (picture 1) was “Insalata di Natale Sicilano” which was a Sicilian salad with chicory and capers. I didn’t enjoy it – just not my taste at all. Third course (picture 2) was “Pappardelle con cipolle confit e Pisello Orders” which was a (cold) pasta with Parmesan cheese and some creamy sauce. I really enjoyed it! Fourth course (picture 3) was the main course and I’d chosen “Toscia di Tacchino Ripieno Avuolta in Pancetta”. This was the turkey dish with a twist – it was a rolled turkey thigh, stuffed with stuffing and wrapped in pancetta. It came with a little covering of gravy and served with traditional selection of veg. Fifth course (picture 4) was the pudding and I’d chosen “Zabaione di Natale” which was a cold Italian custard infused with Christmas pudding. It looked very impressive as it came out! I tasted it and it was nice except it was full of brandy! I decided not to eat it because 1) I can’t drink and 2) I was driving and really didn’t want a stop from the Police! Shame really because it would’ve been nice! The party entertainment was jazz music as chosen by my boss. It was very entertaining but the most entertaining thing about it all was the dancing! I don’t dance… there is no way in hell I will dance… (the only dance I’ve ever done was our first dance at the wedding and that was only because I had to!). Watching other people drunken dancing was hilarious! I so wish I could share my boss’ dancing with you but I can’t do that to him! But I will share this video with you … I believe this was Billy Thompson on the fiddle. Very good I must admit! There’s one more outing that I’m hoping to achieve before Christmas (other than going to see The Hobbit on saturday) and that’s taking Little Miss to see Father Christmas at Llechwedd Slate Caverns. She is supposed to be 1 to enter but considering she’s only 3 weeks shy of being one I’m hoping I can sneak her in!! Have you had any Christmas outings/parties yet? Or have you got some planned? The turkey main course sounds delicious! I’ll come and link up to this once I post about Speyer Christmas market – those are my only Christmas outings. A Christmas market sounds like a great outing! Wow your Christmas meal looked amazing! I’m definitely intrigued by the cold pasta. I might look for a recipe and try it. It sounds unusual and odd! 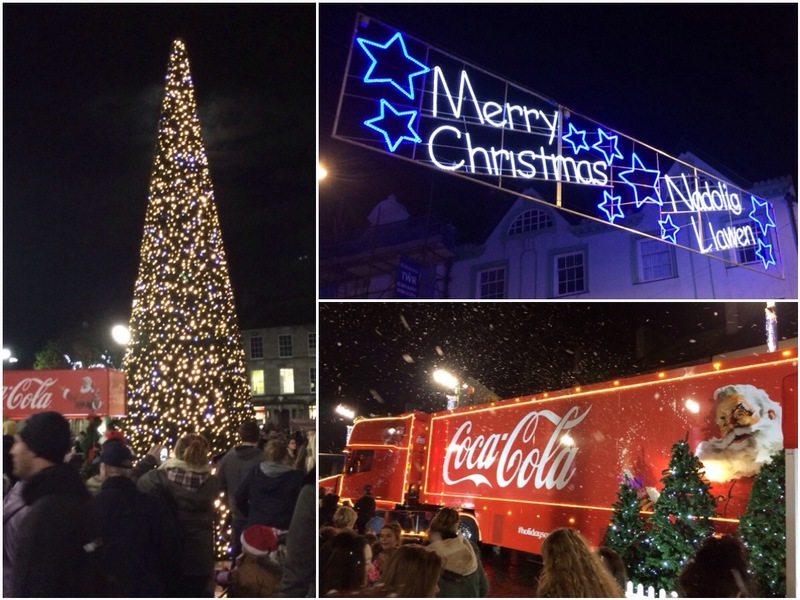 I’m also hoping to go see the coca cola truck when it comes to Milton Keynes – and you’ve just reminded me to check the date of when it comes before I forget and miss it lol! It was lovely! I was pleasantly surprised at how good the food was to be honest! Hope you get to see the truck!